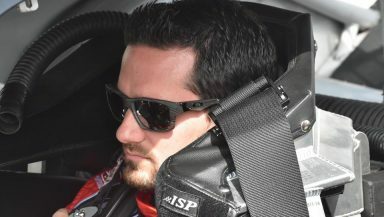 Jeremy Clements survived a tumultuous finish at Talladega Superspeedway to snare a career-best finish of fourth place in the Sparks Energy 300 NASCAR XFINITY Series race and win the Mobil 1 Driver of the Race. The driver of the No. 51 Kevin Whitaker Chevrolet/BRTExtrusions Chevrolet with new sponsor Signs and Displays Direct (SDD) drove from a 34th starting position to lead seven laps and contend for the win. The race ended under caution in overtime when Joey Logano made contact with leader Elliott Sadler, sending Logano into the outside wall. Clements’ fourth place result moved him up three positions to 13th place in the championship standings. In 209 XFINITY starts, his previous best finish was sixth at Road America in 2014. The top five is a career defining moment for this small family-owned team. Jeremy Clements Racing (JCR) only has two full-time and three part-time employees but what they lack in numbers, they make up for with dedication. They have a rich history entrenched in NASCAR. Clements is the grandson of Crawford Clements, acclaimed engine builder, and the nephew of crew chief Louis Clements who won a championship with NASCAR Hall of Famer Rex White in 1960. Their engine development program continues today under the leadership of his father and uncle at Clements Automotive Racing. They play a vital role in the team’s success by supplying the engines for the No. 51 Chevy. Clements has an affinity for Talladega and heading into the race, he commented on the unpredictable nature of the track. Clements’ hopes were realized Saturday and he was ecstatic after the race. I caught up with him Tuesday and he talked about the significance of the top five finish, both personally and for his team. He is also confident that his fourth place finish at Talladega will give his team “momentum going into Dover in a couple of weeks.” It’s a track where they have put together good runs in the past, including a top 10 last year. The series returns to the track May 14 at Dover International Speedway as Clements and the No. 51 team continue to pursue their goal of making it into the top 12 to compete in the first elimination-style Chase for the XFINITY Series.